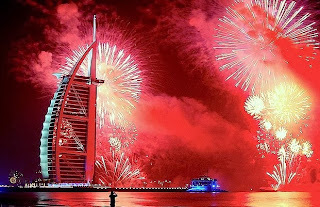 In Dubai thousands of people, who watched the Dubai New Year 2014 spectacle from various locations, were left spell-bound. Dubai shattered the world record for the largest ever pyrotechnic display on New Year's Eve with a show involving more than half a million fireworks, Guinness World Records said Wednesday. The mesmerizing display of fireworks encircled the Palm Jumeirah, the World Islands and Burj Al Arab. Enough fireworks were launched in the first minute of the display to break the previous record, set by Kuwait in 2011 with an hour-long show of 77,282 fireworks. "Ten months in planning, over 500,000 fireworks were used during the display which lasted around six minutes, with Guinness World Records adjudicators on hand to confirm that a new record had been set," the Guinness website said. The display spanned 94 kilometres (58.4 miles) of the Dubai coast, which boasts an archipelago of man-made islands and Burj Khalifa, the world's tallest tower, Guinness said. US firm Fireworks by Grucci designed the display, Guinness said, using 100 computers and 200 technicians to synchronize the pyrotechnics at a reported cost of around $6 million (4.3 million euros). The show was broadcast-ed live on Dubai TV to millions of spectators. Dubai has been vying to become a permanent fixture on the world map of New Year celebrations, staging spectacular shows since the opening of the 828-meter (2,716-foot) Burj Khalifa tower in 2010. Thousands of amethysts lit the night sky as red and silver fireworks cascaded the 828-metre tower. This year's highlights, however, was the fireworks shaped like the petals of the Hymenocallis desert flower - from where the Burj Khalifa's design was based. The petals created the illusion of it enveloping the tower. Crowds thronged the beaches of Umm Suqeium, Jumeirah and Jumeirah Beach Residence, from early in the evening, despite chilly weather. Families, with children only months old, stationed themselves from as early as 5pm to get the best possible view of the spectacle. “I came with my family from Abu Dhabi just to watch the fireworks. We started at 12 noon, reached here at 5pm. It’s been a wonderful evening, really worth the wait,” said Hamid Mirza, an Engineer based in capital. Families came from as far away as Fujairah and Ras Al khaimah, where as many people flew in from neighbouring countries to be part of the world Record. "I travelled all the way from Egypt and it has been a fabulous trip a truly spectacular show," said Cherif Farrog. Roads could be seen completely blocked around Burj Khalifa as well as the Jumeirah area. People got themselves on every inch of vantage points to get the best possible view of fireworks. People climbed up the bridges and parked their cars at the height as far away as Al khail road and Al Ain Road. "The show was great, it's the most amazing fireworks show that I've seen in my life," Aya, a tourist from Sudan, told Gulf News.